West Florida Flames is pleased to announce the appointment of Kacey White as the new Associate Development Academy Director. White joins our West Florida Flames leadership staff after most recently serving as Head Coach of the U16 U.S. Soccer Youth National Team. As Associate Academy Director, White brings a high level of expertise in player development and will work with our Girls and Boys Technical Directors to further enhance the player development model and roadmaps for all our club players. White will also be coaching within the Girls’ Development Academy taking over a younger and older team for the 2018-2019 season. Jorge Zavala, Director of Soccer. 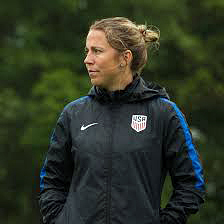 White was a member of the U.S. Women’s National Team during her playing career. She earned 18 caps with the U.S. WNT from 2006-2010 and was an alternate for the 2008 U.S. Olympic Team. She played professionally in Sweden with Balinge and AIK as well as in the WPS for Sky Blue FC, Magic Jack and Atlanta Beat, where she won a WPS Championship during her career. White was an All-American who won three (3) ACC Titles and one (1) NCAA National Championship in her career at the University of North Carolina. White was the Head Coach of the U16 GNT, as well as, working extensively as an assistant for the USA’s U14, U15 and U17 World Cup National Teams during the past 3 years. White had a brief stint as Head Coach at Xavier University prior to coaching on the National Team. She was also the head coach at the University of Wisconsin-Green Bay and was an Assistant at the University of Oklahoma and Texas Tech. She also served as Director of Coaching for the Capital Area Soccer League now known as NCFC. “I am extremely excited for the opportunity ahead of me and could not be more thrilled to be joining the staff at West Florida Flames. Their commitment to the development of each individual person and player is not only evident, but contagious and after seeing it first-hand I immediately wanted to be a part of it. What WFF is doing on a daily basis is changing the face of club soccer and if I was a young player, I couldn't imagine a better environment with which to become the best version of myself. It is humbling to join such a great group of people that not only speak about a focus on development and a continual growth mindset but live it each and every day. I look forward to working alongside all the coaches and players and doing my part to add to the already stellar reputation at West Florida Flames."